Drinkware from the final frontier! Shot glasses based on fine art from Star Trek: The Original Series. 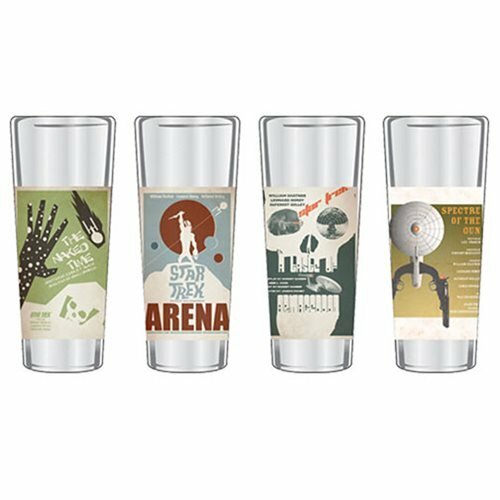 Set 5 includes glasses from TOS Episodes 4, 18, 23, and 61. Start your collection now, and don't miss a single set! Star Trek The Original Series Fine Art Shot Glasses are a remarkable collection of high-quality 2-ounce glasses featuring designs derived from the Star Trek: The Original Series Art Program that includes inspiration from The Original Series with 80 movie-style pieces of art eclipsing every episode of the initial Star Trek television series, including the first pilot. Each individual glass displays a 4-color image unique to a specific poster and episode, and each set includes 4 glasses packaged together. Start your collection now, and don't miss a single set! 1x Episode 4 "The Naked Time"
1x Episode 23 "A Taste of Armageddon"
1x Episode 61 "Spectre of the Gun"
Meets California Prop 65. Hand wash only. Not dishwasher safe. Do not microwave. Thoroughly hand wash before first use. Ages 18 and up.